Spinach has a high nutritional value and is extremely rich in antioxidants. It is a rich source of vitamin A (and especially high in lutein), vitamin C, vitamin E, vitamin K, magnesium, manganese, folate, betaine, iron, vitamin B2, calcium, potassium, vitamin B6, folic acid, copper, protein, phosphorus, zinc, niacin, selenium and omega-3 fatty acids. Spinach contains a strong antioxidant called kaempferol, which helps prevent the formation of cancerous cells in the body. These leafy greens will help slow the effects of ageing on the brain due to its folic acid conten, a B vitamin which also assists the body in maintaining a healthy heart. 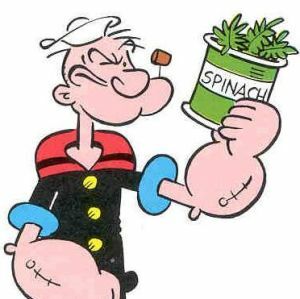 Just a single portion of spinach will help lower high blood pressure within hours due to the mineral magnesium, which helps prevent cardiovascular disease. Spinach holds high levels of iron, which carries blood and oxygen throughout the body and is responsible for lessening fatigue and giving you that added energy boost.